Category Archives: Ohana means family. my own brand of happy. i met up with two old friends today. seems like this trip has been full of hello’s. i rather enjoy that, i think. there’s nothing quite so…happifying…as a hug and hello from people that you’ve managed to keep in touch with over the years. it’s always a pleasant surprise to me, especially in the age of cyber everything. to meet up with someone for a coffee. especially someone you’ve never really actually hung out with…for them to take the time to come out to see you. and then wish you a happy birthday. it’s hard not to be happy when life is so full of love. Filed under Ohana means family. Please forgive me…I lost track of time, but I never forgot you. It’s been 7 years. Mr H., I miss you. Filed under Inspiration, Ohana means family. Lots of people have scolded me over the past two years because I completely stopped watching Canucks hockey since my beloved team fell apart. That team…the West Coast Express era…were the past, and our team now is great. WCE is the past, Echo. You gotta let it go. You can’t just give up on the game you love to watch. You’re the only one who’s never fallen off the wagon. Well, I’ve never been on a wagon…I’ve watched them since day one in Canada…I watched them as I learned English at the Pacific Coliseum. I watched with so my anticipation, excitement, and eventually in tears as their 93 Stanley Cup run ended in disappointment. I watched through the Keanan reign of terror…with a broken heart as they traded our Linden. 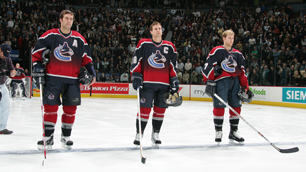 I watched as slowly, they rebuilt it into the first class Canucks team that was led by Nazzy. I watched the Sedins grow from silly bunnies to a formidible second line…to being our 2 for 1 captain. I watched Matt Cooke score…two veryvery fantastic goals…2 seconds to go, how do you beat that? with a 1.2 second goal. I watched as I choked on the apple I was eating, tripping over my blanket, and received txt after txt after call from my friends congratulating my boy. I watched as year after year, Clouts ruined Nazzy. I watched as Vancouver fell off the bandwagon one by one…as Bert defended our captain. As we sent them both off…without a big hug and eternal thanks. His greatest fault in Vancouver was only that he got older as a player. Ours is that we didn’t let him. Tonight makes everything better. – The Vancouver Sun. When you recognize 20+ guys by their stride…by their eyes…it was no longer just a hockey team. Those were memories, that was pride. It was family. It’s difficult to say good bye to family. Welcome home, Nazzy. I’ll always miss you.